Ada pertanyaan untuk History Hotel Angliyskaya Embankment? 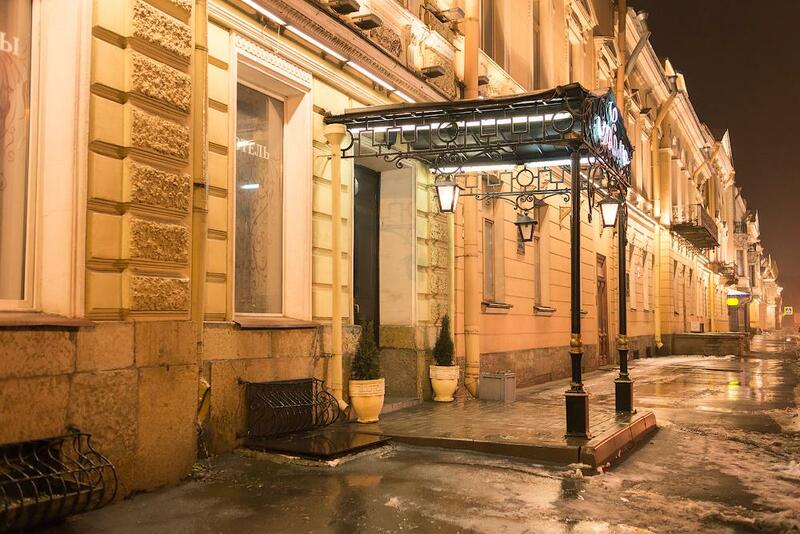 Bagi para wisatawan yang ingin menjelajahi kota Saint Petersburg, History Hotel Angliyskaya Embankment adalah pilihan yang sempurna. Pusat kota terletak hanya sekitar 0.5 Km dan bandara dapat ditempuh dalam waktu 40 menit. Dengan adanya obyek wisata utama kota ini seperti Museum Negeri Sejarah St Petersburg, Pulau New Holland, New Holland yang sangat dekat, pengunjung akan sangat menyukai lokasi hotel ini. Gunakan kesempatan untuk menikmati pelayanan dan fasilitas yang tidak tertandingi di hotel Saint Petersburg ini. Para tamu hotel ini dapat menikmati fasilitas di tempat seperti WiFi gratis di semua kamar, resepsionis 24 jam, Wi-fi di tempat umum, layanan kamar, antar-jemput bandara. Masuki salah satu dari 21 kamar yang menggoda ini dan lepaskan rasa penat Anda dengan sejumlah fasilitas yang tersedia seperti akses internet WiFi (gratis), kamar bebas asap rokok, AC, penghangat ruangan, layanan bangun pagi. Disamping itu, hotel memiliki berbagai pilihan fasilitas rekreasi yang menjamin Anda melakukan bermacam hal selama menginap. Apapun alasan Anda mengunjungi Saint Petersburg, History Hotel Angliyskaya Embankment adalah tempat yang sempurna untuk liburan yang menyenangkan. I was surprised to get big room for little money with quite high Wi-Fi speed. Hotel is a little shabby and not the cleanest one but it stays in historical part of Saint-Petersburg and it gives the sense of going back to the past:) If you need great hotel facilities and pay too much attention to unimportant comfortable things, then you better go to different hotel. But if you want to feel the spirit of this city and stay close to a number of sightseeing place, welcome. We had a room just outside of the the main building, which was a huge suite, with high ceilings. The beds had sheets too small and we were both bitten by what was either ants or bed bugs. Either way it was not very nice. The breakfast was poor. The building location is such that this hotel could be really great, but it isn't. The staff were very friendly so I wanted to like the hotel, but ultimately it was not that great. Good location, Very large room, Good value, friendly staff. Nice hotel , good rooms but it is very far away from metro or bus station. Conveyance from hotel is the only negative factor i think. otherwise the hotel is like a palace. liegt an der neva und das zimmer ( juniorsuite ) war riesig und angenehm möbiliert , das personal war sehr hilfsbereit , das frühstücksbuffet war einfach aber o.k.